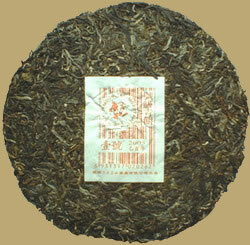 This high quality green Beeng Cha belongs to the series Raw Pu-erh cakes grades 1 through 6, produced by Six Famous Tea Mountain Industry, Red Label (No. 1) is Grade 1. Limited quantity, suitable for drinking now or putting away for further aging.